This display marks the bicentenary of the birth of George Eliot (1819–80), one of Britain’s most renowned novelists. Born Mary Anne Evans on 22 November 1819, she embarked on her career at the relatively mature age of thirty-two, initially working for the radical London periodical, the Westminster Review. In 1859, her first novel, Adam Bede, was published to critical acclaim and she went on to write six further titles, including The Mill on the Floss (1860) and Middlemarch (1871–2), celebrated for their realism and insights into the messy complexity of human relationships. 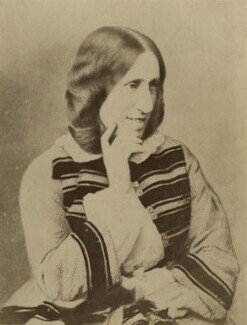 Evans adopted the pseudonym ‘George Eliot’ to retain her anonymity. Since 1853, she had been romantically involved with a married man, the writer George Henry Lewes; although separated from his wife, their relationship was regarded as improper. Eliot also had concerns about her physical appearance, as her face had been described as ‘long’, ‘pale’ and horse-like. A pen-name could avoid drawing attention to both her awkward social position and unconventional looks, and allow her novels to be judged on their own merits. Eliot’s efforts to keep a low public profile extended to the visual image, this display’s central theme. At a time when the trade in popular portraits of celebrities was flourishing, she was extremely wary of being photographed. The NPG holds most of the few known portraits of Eliot, five of which are included in the display. The circumstances of their production and display reveal Eliot’s conflicted regard for portraiture and portrayal.